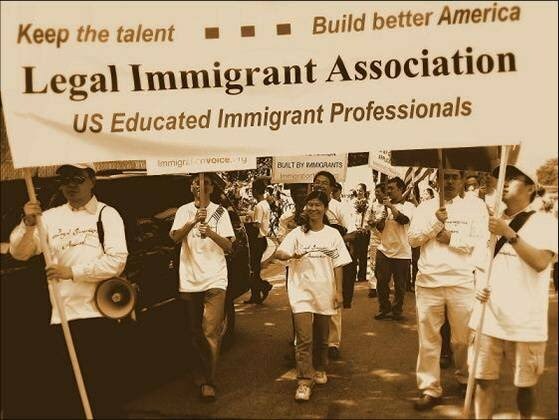 Founded in August 2007 by a group of Silicon Valley engineers, Legal Immigrant Association (LIA) is a non-profit organization dedicated to the social well-being of employment-based (EB) immigrant professionals. Since then LIA membership has expanded beyond Silicon Valley across the nation, with most members holding U.S. advanced degrees. LIA is currently working to reduce the green card backlog that has troubled the high-skilled immigrant community. The high-skilled immigrants have been recognized not only as a workforce indispensable to American economy, but also as law-abiding, tax-paying and self-dependent individuals. However, behind this model image, there are numerous untold miserable green card stories. Under the current immigration system, it can take up to ten years for an employment-based immigrant to get his/her permanent residency, who is also required to work for the same employer without promotion throughout this period. Such career immobility is talent-suffocating and makes the green card applicants very vulnerable to work abuse. Running one's own business is also out of the question without green card. LIA wants to change these people's life by advocating new immigration policies to reduce the green card backlogs and to improve government efficiency. History has already proved that that these high-skilled immigrants will become more productive contributors to U.S. economy with their entrepreneurship unleashed and their full potential realized. Here is a presentation of LIA.